There is a lot of talk among the economics journalists about the impending collapse of China, apparently drowning in mountains of unsustainable debt. Don’t hold your breath. The Chinese government fully understands its capacity as the monopoly issuer of its currency and demonstrated during the GFC how to effectively deploy that capacity. That doesn’t mean that the Chinese economy might record slower growth in the period ahead – but as Japan demonstrated in the 1990s after it experienced a massive property bubble burst – slower growth is not collapse. Appropriate use of fiscal policy can always prevent collapse if there is a will to do so. 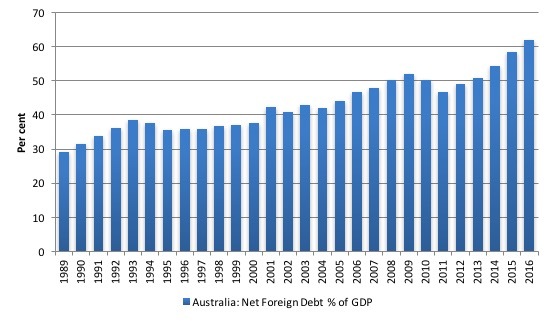 Further, Australia’s net foreign debt has risen significantly over the last few decades and now exceeds $A1 trillion. Most of it is non-government and the private banks have been at the forefront of the increase as they have been racking up loans from foreign wholesale funding markets. With China slowing, there is a possibility that the conditions for servicing these private loans may deteriorate. A chief of a credit rating agency (S&P) has been getting airplay in Australia the last few days claiming that this increased vulnerability arising from the foreign debt exposure requires the federal government to get into surplus as quickly as possible to provide it with the capacity to “absorb shocks” arising from a correction in the banking sector. His insights are nonsensical. Exactly the opposite is the case. The ABC report yesterday (May 31, 2017) – Big banks putting Australia’s AAA credit rating at risk, S&P ratings boss says – claimed that because Australia had a “massive level of external debt” that the ratings agency would be forced to downgrade our credit rating. That is, S&P are claiming that the higher external debt, the higher would be the risk of default. There is truth in that statement when applied to the non-government exposure. But there is no truth in that conjecture when applied to government debt, unless that debt is denominated in a foreign currency. So the first question being raised is whether we should worry about that scale of foreign exposure. The ABS provides data for – Australia’s Foreign Debt position. 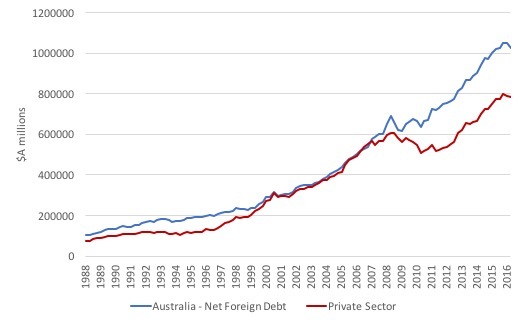 The following graph shows the stock of Australia’s net foreign debt (foreign assets less foreign liabilities) from the September-quarter 1988 (when the data series began) to the December-quarter 2016 by total and private sector. The difference between the two lines shown is obviously public sector debt (which is made up of general government and public sector financial corporations). You can see that Australia’s Net Foreign Debt is now above $A trillion and at the end of June 2016 ($A1,023.6 billion by December 2016) – this was 61.9 per cent of Australia’s 2015-2016 nominal GDP. We would now be in breach of Eurozone fiscal rules! The following graph shows the annual movements in Australia’s total net debt to GDP ratio since 1989 (annual data evaluated as at the end of June in each year). The federal government’s overall net debt position is around $A320 billion and although about 60 per cent of it is owed to foreigners, none of it is denominated in foreign currencies. The other 40 per cent by the way is largely owned by Australian banks and other investors (superannuation funds etc). The foreign debt accumulation arises in a number of ways. First, we run persistent current account deficits (we import goods and services and net transfer income more than we export goods and services). The capital flows that accompany these trade patterns result in borrowing from abroad or in direct investments in our assets. The net transfer of income (the ‘net income deficit’) is the interest and dividends we pay on those foreign funding sources. In Australia’s case, even if the trade account is in surplus (rarely), the overall current account is in deficit because of these net income flows abroad. This is why our foreign debt has been rising. 1. The debt to GDP ratio has been rising lately which means the interest component of total income is rising. When does the private sector, which is holding most of the debt find the rising interest burden to be a problem? The answer is when the economy enters a recession or a significant slowdown and the capacity of the private sector to repay the debt becomes impaired. If the non-government, foreign debt is denominated in a foreign currency, then the problem is extended and requires export growth to continue. Argentina encountered its debt crisis in late 2001 because a significant portion of its debt was denominated in foreign currencies (particularly US dollars) and repayment was reliant on export revenue to generate stockpiles of these foreign currencies. The peg against the dollar exacerbated matters and further drained foreign currency reserves. 2. A proportion of the foreign debt is clearly borrowed to fund non-government capital formation, which increases productive capacity and future income potential. In that sense, even if the debt levels are rising, there should be no issue if the productive capacity expands and the capacity to repay also expands. In terms of sectoral balanecs, if the non-government sector is still saving out of disposal income in a growth environment and the current account deficit reflects capital imports (machines, equipment, intellectual capital, etc) then the alarm bells will be silent, no matter what S&P and its like says. So it is the composition of the private domestic balance that should be considered when thinking about the non-government, foreign debt exposure. At present, Australia’s private investment ratio is at depressed levels as the economy grinds along and investment opportunities are considered to be weak. But then the current account deficit has also shrunk from an average of around 4.8 per cent of GDP up to the GFC to something around 2.5 per cent now. In part, this has been accomplished by a reduction in interest rates that hhave reduced the net income deficit and the cross-border payments that flow from that (net outflows). The S&P argument is somewhat different to the usual fear of foreign debt as a matter of course. Among other things he said they were focusing on the “fiscal trajectory … path back to balanced budgets and even surpluses down the road” as well as the non-government credit conditions relating to the housing market. You can see the – Extended interview with Moritz Kraemer – Global Chief Ratings officer for S&P. Now in order to offset that, Australia needs very strong public finances so if you have pressure on the current acount that the government can actually take counterveiling action, absorb the shock, through the fiscal accounts and that is why we focus on fiscal. If we just compare Australia with Germany, or France, or the US or the UK its very strong, the debt ratio is very low. But it be low because the external vulnerabilities are so high. So we have to weigh against each other these various factors. That is why we express concern about the repeated delay of returning to a balanced budget because Australia needs this fiscal strength in order to compensate the vulnerability on the external side. If a first-year undergraduate student in macroeconomics had have put that series of statements together I would have failed them badly and advised them to explore another career option. As noted above, external debt arising as liabilities of a currency-issuing government, denominated in the local currency is no issue. But the debt of the non-government sector may become an issue under certain circumstances, whether it is denominated in local currency or not. Remember, the non-government sector is a user of the currency of issue. In that sense, its access to it is not much different to its access to foreign currency. It has to earn income, use prior savings, sell assets or borrow in order to spend. Accessing foreign currency to service foreign-currency denominated debt requires them to do the same. The S&P chief focused particularly on the role the private banks in Australia have played in the rising debt. How much of that net foreign debt position is due to Australian-owned banks? 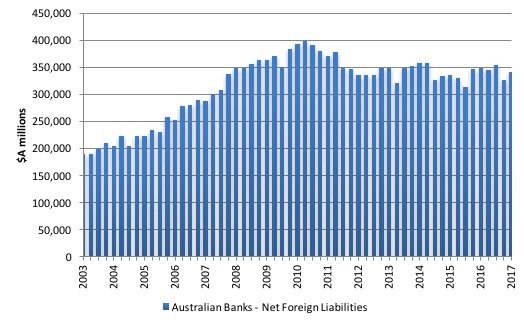 The next graph shows the net international position (assets less liabilities) of the Australian banks ($A millions) (from RBA statistics). Clearly, the banks have reduced their initial exposure that peaked in 2010. Remember, that as the GFC was unfolding, the big four banks in Australia, that dominate the sector as a tight-knit oligopoly, were within days of insolvency in late 2008 when their massive exposure to the frozen global wholesale funding markets meant they were unable to repay their maturing loans. At that point, like all those institutions that survive on ‘corporate welfare’ they went cap in hand to the Federal government and requested that it provide a guarantee on all new foreign currency borrowing. The government duly agreed and the big four were immediately able to access funds and roll over their debt exposures. In the early days of October 2008, money poured into the big four Australian banks from other financial institutions. But life was becoming increasingly anxious for them as well. In Australia, however, the difficulties were on the liability side of bank balance sheets. Banks had become heavily reliant on foreign borrowing and suddenly they were unable to borrow abroad. The non-banks had had no buyers for their securities for almost a year. There are no degrees of insolvency. A firm is just as insolvent if it is not able to meet its financial obligations as they fall due because it cannot roll over debt, as it is if the value of the assets in its balance sheet is deeply impaired. The Australian banks’ dependence on government-guaranteed debt was exceptional: in July 2009, Australian banks accounted for 10 per cent of the world’s government guaranteed debt. Through foreign borrowing to support domestic lending, the big four Australian banks were active, enthusiastic participants in the global shadow banking system that was now unravelling. Which is hilarious – a denial that agrees with the obvious – if they had not gained the guarantee they would have defaulted on loans due. Then their capacity to lend would have disappeared because they would have been bankrupted. Whichever way you want to look at it, it was the federal government’s currency-issuing capacity that saved the Australian major banks in the dark days of the GFC. The major banks were not as robust as they make out. They were about to become insolvent and given their dominance in the sector that failure would have had dramatic negative consequences for the Australian economy and would have required a much larger fiscal intervention. So a large foreign debt exposure by the banking sector associated with a housing market that is reaching the end of the long boom and will correct somewhat in the coming year or so is not a small problem. This is where the exposure to China argument comes into play. China will not go bust. But it might slowdown and the sensitivity of the Australian economy to such a slowdown is probably quite high these days given the lack of non-mining investment and the austerity coming from government. If China slows and the housing market corrects somewhat then Australia’ export side will weaken (perhaps compromising the capacity to service the massive non-government external debt) and the record levels of household debt will start to come into play. That would reverberate back onto the banking sector which requires its non-competitive, high rates of return to keep paying exhorbitant management salaries, service the wholesale debt it has binged upon in foreign markets, and satisfy their overly greedy shareholders. So as far as it goes, the external debt and the domestic household debt is not a small issue. But then to claim, as the S&P Global Chief Ratings officer said in his interview (above), that this requires the Government to get back into surplus as quickly as possible so that it can “take counterveiling action” to “absorb the shock” arising from tension arising from a non-government slowdown is absurd. You can always tell if a person really knows anything about macroeconomics – or is faking it. How? Well, if they start conflating monetary systems. The S&P commentator claimed that it was legitimate to “compare Australia with Germany, or France …” in terms of debt positions. It is never valid to compare a Eurozone Member State, which uses a foreign currency (the euro) to a currency-issuing nation such as Australia. The two governments have very different fiscal capacities and financial constraints on spending. In Australia’s case, the federal government has no intrinsic financial constraints on its capacity to spend in Australian dollars. In that sense, what meaning should we place on the federal government having “very strong public finances” and requiring those positions (which in this context means fiscal surpluses given the neo-liberal bias of the S&P commentator) to offset non-government spending weakness? Answer: his claim is total nonsense. The fact that the ABC interviewer didn’t pick him up on the rubbish he was talking shows that she didn’t have a clue either. The Australian government has a near infinite financial capacity to buy anything that is for sale in Australian dollars at any time. The only constraint it faces, other than the voluntary financial constraints that arise form its neo-liberal bias, are the availability of real resources for sale in Australian dollars. That is the limit of Australian government spending. So it makes no sense to say that the government has to run surpluses to increase its capacity to spend in the currency it, and it alone, issues. Further, the very pursuit of a balanced fiscal position or even a surplus is the last thing that is indicated in an environment where non-government activity is becoming increasingly precarious. It is a sure bet that if the Australian government vigorously pursued a fiscal surplus, then the likely recession that such a strategy would cause would expose the banks very quickly to insolvency. The non-bank holders of the foreign debt would also be compromised if Australia’s GDP growth slowed considerably on the back of the government austerity push. The point is that a government intent on running surpluses at a time when the external balance is in deficit and private domestic spending is weak, will reduce the capacity of non-government sector to service their loans and assuredly precipitate defaults. A ‘strong’ fiscal position is actually one that is consistent with full employment. In Australia, at present, we are a long way short of that desirable state and so the fiscal deficit is too small. The fiscal dynamic should be to increase the deficit not cut it. The S&P analysis is, as usual, ridiculous and should be disregarded. Better still, the government should outlaw the credit rating agencies. Please read my blog – Time to outlaw the credit rating agencies – for more discussion on this point. That the banks were allowed to deny they were bailed out is absolutely disgusting. If only the government had punished them openly and honestly or had a clause for the bailout that they must be honest with the public. This meme sadly still persists that our banks weren’t bailed out like the rest. It’s critical for governments to control the present and future narrative or the public gets swindled. 1 – I find it amazing that a rich country like Australia, which is also a net exporter of primary products, persistently runs current-account deficits. It is like a person with high income who has a big credit card debt. 2 – Aren’t China’s banks government institutions? In that case, they share the government’s immunity to insolvency. Prof .Mitchell is right to insist that there is no risk of a currency issuing government becoming unable to service debts in its own currency. This is a very simple and obvious point. So why are the sovereign debts of currency issuing governments not all rated AAA? Prof. Mitchell argues that this is because credit rating agencies are “ridiculous and should be disregarded”. However, I suspect he misinterprets the purported role of so-called “credit ratings”. It is unclear exactly what credit ratings are supposed to indicate. But the ratings are plainly trying to indicate far more than merely the default risks of government debts. They seem to be trying to indicate the risks to foreigners of losses associated with many sorts of investments. In particular there are risks due to exchange rate movements and asset price declines. For example, if a foreigner exchanges $US for $A in order to buy Australian government bonds, or bank stock, or real estate, he will make a loss if the $A depreciates by more than the interest on the bonds, or if equity or real estate bubbles burst. If this is so, the default risk of government bonds is an irrelevant or minor issue in most cases. More important criticisms of ratings concern the lack of clarity regarding their purpose, and weaknesses in their analysis of a investment prospects. Thank you for this insightful blog post on Australia’s external debt. I have been trying to get my head around the intricacies for a while now and this has help me progress a lot further. There are still a few details on how the foreign debt is accumulating and why that I’m unsure of though, and it’d be helpful if you could clear it up. Especially in regards to how “foreign wholesale lending” is somehow increasing the Australian banking sector’s capacity to create loans for real estate. This doesn’t make sense to me, since surely the banks just need to create the AUD credit/liability for this? I don’t see why foreign debt needs to come into it, or how it benefits the banks in anyway. Except the link to the blog with more information has not been put in. I want more information but I’m not sure what blog to look for. Are you referring to this one? An Australian bank borrows USD from a US bank, and then sells it to a US firm for AUD they received from (net) exporting to Australia. So now instead of having a US firm with a domestic AUD deposit on the Aus bank’s liabilities, the Aus bank has a debt to the US bank in USD on their liabilities. So the debts to foreign banks are in foreign currencies. During the GFC these debts would be called in, and the Aus banks wouldn’t have been able to pay (without a govt guarantee), since they’d have to sell off lots of AUD for USD to repay loans – which they presumably didn’t have on hand due to liquidity constraints. I’m guessing that’s what you meant regarding “banks shouldn’t be allowed to borrow in foreign currencies”. I.e. Leave it to non-bank currency speculators who want to borrow USD to short sell the USD and take on that foreign debt exposure. Unless you’d ban these transactions too? I also seem to recall you saying banks are currently playing in this currency speculation game, which is no doubt also another source of the external debt given they’d be doing the same short selling and foreign borrowing which non-bank currency speculators are doing. So this brings me back to the other mystery… How on earth does this all fit into increasing an Australian bank’s capacity to lend? I don’t see why this is necessary to support Australian bank lending and I don’t understand how this is tied into the property market. I mean I understand bank loan portfolios are tied to those mortgages, but those mortgages don’t pay them USD (or other foreign currencies) to repay those foreign debts. Presumably they have to first sell their AUD revenue for foreign exchange before they can make good on servicing those external loans. Does it have something to do with borrowing the foreign currency (e.g. USD) at a lower interest rate than the Aus cash rate, and then buying AUD exchange settlement funds (or extinguishing AUD liabilities held with them) at an effectively lower cost to reduce costs on interbank settlements (compared to borrowing them at the cash rate or from the RBA), and thus enhance the Aus bank’s profitability/margin on (e.g. real estate) lending? If that’s the case, then no doubt this is completely unnecessary and being done purely to maximise short term profits at the systemic risk of the banking system. If the government is forced to guarantee the Aus banks’ foreign denominated debts (as you mentioned in this article), then the government is in fact taking on default risk in a foreign currency – or at least risk of a currency crisis by potentially forcing a mass depreciation in the process of buying those foreign currencies to repay those external debts. It makes sense then why you have called for domestic banks to be prohibited from borrowing foreign currencies. Since if the banking system (or specifically the big 4) is TBTF, then the government implicitly is guaranteeing their foreign denominated debts and thus taking on foreign currency default (currency/exchange rate crisis) risk. Wouldn’t this be a serious problem? That Australia exports primary products – especially minerals – and then imports them all back in the greatly value-added form of finished goods may go some way toward explaining the situation. Like Jesse Hermans above, I also wonder why banks need to borrow from off-shore? In New Zealand we are repeatedly told that banks need to borrow off-shore to fund the housing market, because Kiwis aren’t saving enough to fund bank lending. So why do banks borrow from overseas when they don’t need “loanable funds”? Surely not for their capital requirements? someone can correct me , but I think the problem is with the cost of funding and margin . its probably cheaper to borrow exernally, less of a margin constraint and try and mitigate the currency risk through hedging. and what set of books do these whole sale funding transaction end up in . is securitisation a mechanism to circumvent a domestic capital constraint in terms of what gearing ratios they run and fulfilling their basal obligations. The cost of funding would make sense, however it isn’t necessary for the system. The limitation on whether a bank makes a loan is how profitable that loan is. Wholesale lending in foreign (hedged) currency at lower interest rates, then used to buy AUD (from either their own customers which extinguishes their liabilities, or from other banks and their customers which brings in Exchange Settlement Funds assets), would no doubt reduce the cost of interbank settlements and improve overall bank profitability. However I don’t see how that affects an individual loan. What probably happens is when the banks have this wholesale funding they use it to either boost profit margins overall by reducing total costs, or increase lending (market share and the size of the market) by reducing the interest rates they charge customers – thereby making it more attractive to borrow. Either way none of this is necessary for the system to function. If banks were cut off from additional foreign wholesale lending and “passed on” those costs to borrowers through higher interest rates (and thus less loans given the price of money goes up), the RBA could simply compensate by lowering the cash rate to the point where its interest rate matches what the banks were initially borrowing at from overseas to being with. Thus costs would remain the same and lending shouldn’t change. Domestic banks thus aren’t “dependent” on overseas wholesale lending, they simply borrow from overseas because they can get around the RBA’s target cash rate, thereby borrowing at a lower interest rate than the central bank wants them to. Which makes no sense for monetary policy given you’re trying to control the price of Exchange Settlement Funds, and this seems to undermine that. Doesn’t affect readability, but shouldn’t there be an apostrophe on the “its”? This sounds weird. Unless Moritz actually said that. Credit ratings agencies should really stick to areas they actually have knowledge in, shouldn’t they? I doubt the ratings agencies give much weight to exchange rate risk. Canada has had a AAA rating for many many years despite repeated wild swings in the exchange rate. A few years ago it was higher than the US dollar and today it is around 75 US cents. Yet the AAA rating has remained. Any quote I have seen by ratings agencies involves some version of default risk, although this is an anecdotal observation. I have a question about the current account deficit and the result of a governement surplus which perhaps is worth developing? A surplus might as a I understand it reduce household income (through taxes) and increase total saving and through further slack in the labour market reduces wages and increase profits while reduced current account deficit might reduce the capital account surplus and a depreciated currency will boost exports and reduce imports? If the capital account is more driven by speculation and capital movements chasing interest differentials (Japan) the currency might not depreciate if not the housing market is punctuated through taxation and restictiv legislation? The process to restore a balanced current account and pusch for export led growth would be painful of cource. I’m probably ignorant, but maybe the S&P guy was thinking in such terms? Journalist may be wrong. It seems capital inflows and cheap credit drives the australian housing market and consumption? Excellent blog post.clearly going into a a fical surplus would prompt a recession and limit households abilities to meet debt obligations creating a bunch of npl assets for the bank oligilopoly making the banks foreign debt liability unaffordable,bringing about the very problem S&P are warning against. One question regarding your point about foreign debt obligations not being a problem in a growth enviroment and if it expands productive capacity as it is mainly capital imports(machinery,intellectual capital). I guess as long as the productive capacity is increased a country like austrailia wouldnt incur exchange rate risk,but if demand for comodities dropped and $A dropped then it will be even harder for banks to repay foreign denominated loans if its income is in a depreciating currency.Or more accurately if the value of its $A based assets depreciates relative to the foreign denominated funding costs interest charges,it will no longer be capturing a profitable spread. I think you are mistaken on a nuance,a banks ability to lend will be limited on profitability;including on access to cheap funding.The RBA cash rate is not a long term funding solution,foreign wholesale deposits are cheaper and allow(well except for when it doesnt see above for ’08) a bank to rollover debt at a cheaper rate.A bank will need to fund its loan book through the cheapest source of deposits via foreign or domestic sources. I to am confused by banks borrowing in external currencies to ‘fund’ their loans. When a bank issues a loan, let’s assume $100,000, it creates both a deposit and a liability. The loan is an asset for the bank, payments for the loan are its income. Now our imaginary person has $100,000 and they want to begin buying goods, the bank needs to ensure that it meets the governments surplus rule with its account at the reserve – which means having all customer deposits +1. At the end of every day if the bank is short they need to borrow the funds from a bank with surplus reserves, this can be a commercial bank or a foreign bank holding Australian dollars (eg Federal Reserve of USA) – surplus reserves are added through government spending – this means the government needs to spend more than it taxes each day. The interest rate they pay on these loans is the RBAs cash rate. Now if the bank wanted to ‘cheat’ the system and pay less to satisfy rules for meeting reserve requirements, it would have to find a foreign currency that is cheaper to borrow than the Reserves cash rate, borrow it then exchange it for Australian dollars. Then you still have to factor in the exchange rate which would fluctuate. It is a pretty high risk strategy for what would be, I think, a pretty minor saving. Like you mentioned, the RBA could simply move the interest rate to be in line with the foreign currencies rate. Again like you said this seems to undermine the RBA monetary policy objective of setting the cash rate.